Veröffentlichungen auf dieser Seite unterliegen dem §11 des Gesetzes über die Werbung auf dem Gebiete des Heilwesens. Patienten schildern ihre Eindrücke bei Jameda, auf eigenen Websites wie der der Wilkie-Selbsthilfegruppe aus Österreich. Zu Fragen der Gefäßkompressionssyndrome (May-Thurner-Syndrom) hat sich auch eine facebook-Gruppe gebildet. Ein Beitrag aus den USA ist ebenfalls lesenswert. Wir melden uns .. zurück. …wurde schneller wie geplant operiert. Alles super gelaufen und wir freuen uns Ihnen mitteilen zu können, ERFOLGREICH. Wir sind dem kompletten Team um Professor Sandmann unsagbar dankbar. Linus ist vollkommen beschwerdefrei, er kann auch länger als 2 h wieder sitzen. Traumhaft. Sein erster Satz nachdem er keinen Schmerztropf mehr brauchte war : Mein neues Leben beginnt. Wir sind so froh Sie als Arzt zu haben. Durch Sie wurde dass alles ermöglicht und ein jahrelanger Leidensweg ist zu Ende. Jedem Arzt ein Teil von Ihnen übertragen und ALLEN wäre geholfen. DANKE Ihnen und Ihrem Praxisteam. ..
Wir sind so froh, Sie und unsere Ärztin Frau Dr. …haben immer an ihn geglaubt und waren beide hartnäckig so sind wir ans Ziel gekommen. Es ist wundervoll dass es Sie alle gibt, auch das Team in Mettmann. Wir sind überglücklich, vor allem …. Wir hatten auch von Anfang an Vertrauen . Liebe Grüße von Familie … ..geht es gut. Die Wunde von der AV Fistel ist gut verheilt. Die Narbe am Bauch zieht ab und zu aber ansonsten ist alles gut. Sie isst gut und das Gewicht ist bei 41 kg. Es steigt langsam. Die erste Hose vom letzten Jahr passt schon wieder. Kräftemässig muss sie nur noch zulegen. Wir laufen fast jeden Tag eine Runde. das ging … sehr schnell! Vielen DANK! 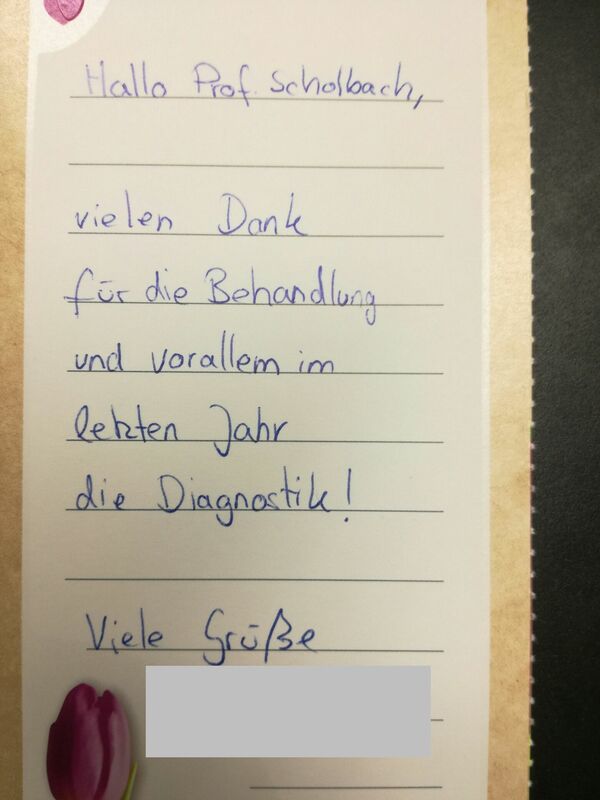 Vielen DANK für Ihre großartige Diagnostik! Es hilft wahnsinnig wenn man weiß von was die Symptome kommen. This time I wanted to write you directly. Since this time it’s not medical related. As I mentioned to you before, I am not so great in writing. I either write too long , or not too good. Anyhow.. Happy happy birthday! I wish you a lifetime of health and happiness for You and for your loved ones! Thank you for always being the voice of my body’s misery. Without you, I wouldn’t ever be the person I am today. Without you, I wouldn’t be able to prove any of the feelings/symptoms I had/have. I am Personally very thankful of your birth and I’m sure so many many others like me too…..
Wishing you always the best. I know …wishes the same as well! Thank-you for writing the article about compression syndromes (http://scholbach.de/wp-content/uploads/2017/09/20170917-vascular-compression-syndromes-website.pdf ). I have median arcuate ligament syndrome and had laproscopic release last year with full relief of symptoms, even psoas rigidity/inflammation. Your article shed much light on the psoas involvement and I am grateful for that understanding. I’m 52 years old and have had intermittent stomach pain since age 14, with increasing problems and severity the last several years. I am also a faculty member in occupational therapy at a University in the US, with access to many resources. Your article provided by far the best pathophysiology of MALs (and other compression syndromes) than any other articles I have been able to access. Understanding the pathophysiology is very important because it helps to guide conservative interventions. I have had some return of mild symptoms and have been working with a physical therapist (PT). Your explanations are helping me to decrease compression through conservative stretches (psoas major, rectus abdominus, and MAL) and strengthening (rhomboids, lower and middle traps to pull shoulder girdle back and down in order to raise rib cage) to reduce the MAL compression and the strategies are working. This is an important finding because many people with MALs are not surgical candidates due to co-morbidities and they are in dire need of more conservative approaches. As you know, the only literature on MALs treatment is surgical. Some PT colleagues and I are considering writing a case study to prompt more research on conservative approaches. I would like to cite your article when discussing some of the pathophysiology of MALs …. Thanks again for your contributions and thanks so much for supporting patients with MALs! aufgrund unseres Umzugs können wir den Termin am … nicht wahrnehmen. Auch für weitere Termine müssen wir uns aufgrund der Entfernung einen neuen Kinderarzt suchen. Wir haben uns stets sehr gut betreut gefühlt! I appreciate for your kind reply. As always, we are really Thankful to you for offering excellent treatment and bringing us a Great news. Vielen lieben Dank für die schnelle Zusendung und ausführlichen Befundbericht unseres Sohnes. Wir sind Ihnen unsagbar dankbar. Mit Ihrer ruhigen und hartnäckigen Art haben Sie das Krankheitsbild rausgefunden. Als Eltern sind wir oft an unsere Grenzen gestoßen, tief im Inneren wussten wir dass wir an den richtigen Arzt kommen. Deshalb an dieser Stelle DANKE dass es Sie und Ihr Praxisteam gibt!!!!! Den Rest , die bevorstehende Op schaffen wir mit Ihnen an unserer Seite auch noch. Thank u so much, your informations are gold for me. I Will have always a wonderful memory of you.. Thank u again. I Will do what u said. Sie und Herr Professor Sandmann haben unserer …das Leben gerettet. Wir sagen von Herzen danke danke danke……. Vielen Dank für Ihre Zeitschriften und Bilder!! We are so grateful for your examination and knowledgeable assessment of our son …..
We also thank you for the super quick feedback including journals and ultrasound pictures. Eine unserer Patientinnen, die in unserer Praxis diagnostiziert und von Prof. Sandmann operiert wurde, beschreibt ihre Erfahrungen hier . Thank you very much for taking the time to respond to our email. We greatly appreciate your diagnostic expertise and were very encouraged over your findings. ……Again, many thanks to you for everything. We will keep you and your family in our prayers. in meinem jetzigen Arbeitsfeld ( u.a. Einschulungsuntersuchungen ) bin ich auf Befunde Ihrer Praxis gestoßen – von einem Ihrer kleinen Patienten. Mit großem Stolz und Anerkennung habe ich die Schilderung der sehr zufriedenen Kindesmutter verfolgt. Stolz darauf, vor vielen Jahren mal mit Ihnen zusammengearbeitet zu haben. …Meine Anerkennung und Hochachtung zu Ihren Studien und Entwicklungen wollte ich Ihnen auf diesem Wege ausdrücken. Ich wünsche Ihnen und Ihrer Familie alles erdenklich Gute. Comme je sais désormais que vous lisez le français, je me permet de vous écrire dans ma langue, afin de vous témoigner toute ma gratitude. Je vous remercie pour votre accueil, votre gentillesse, votre rigueur, votre bienveillance et surtout votre professionnalisme. Je n’ai jamais rencontré de médecin comme vous. Pourtant dans mon odyssée médicale de plus de 10 ans, j’ai vu plus de 40 médecins différents, ici en France. Personne n’a su expliquer mes douleurs, ma fatigue, mes troubles avec une si grande précision scientifique. Comme vous le savez , le diagnostique « psychologique » est si vite posé par vos confrères, sans recherches, sans examens, sans réflexion mais avec tellement de jugements moraux. C’est la double peine pour le patient: la souffrance physique et le jugement que vous êtes psychologiquement dérangé. J’imagine combien vos travaux de recherches sur les compressions artérielles ont dû être longs, parfois difficiles, souvent compliqués. Je suis certaine qu’en beaucoup d’occasions vos confrères ne vous ont pas pris au sérieux. Pourtant, vos découvertes et votre compréhension des compressions artérielles est majeure. Vous faites brillamment le lien entre les différents types de compressions et leurs symptômes, grâce à votre écoute des patients. Pour votre curiosité scientifique et votre immense travail, je vous remercie de toute mon âme. Je souhaite être opérée par le Pr Sandmann, car ce sera pour moi un privilège. L’opportunité, la seule, de sortir de ce cauchemar de douleurs. Je regrette sincèrement qu’il n’existe pas plus de médecins comme vous, avec une réelle conviction de leur métier et un grand respect des personnes. Votre diagnostique m’a permis de comprendre ce qui arrivait à mon corps et m’a redonné beaucoup d’espoir. Pour ce que vous êtes et ce que vous faites, je vous remercie infiniment. haben Sie herzlichen Dank für den gestrigen ausführlichen Untersuchungstermin und den blitzschnellen Befundbericht!…..
….Thank you so much for your kind attention and your explanation. It was such a relieve to see by myself what actually happened after taking food and liquid at the exact spot where I felt strangulated! No I can move on….Thanks again for all you have done, it meant a lot. Thank you so much again for your time today. It was very educational to finally have all the answers I’ve been looking for after all of these years. I’m glad I know what compression issues I have now and what steps need to be taken. Thank you for taking the time to meet with me and for preparing the report so quickly for Prof Sandmann. I’m anxious to have some relief from all of my pain and suffering from these illnesses. Thank you for all of your help. This has been a life changing experience, truly. I’m going to recommend you to anyone I know who is struggling to find the answers to their compression syndromes. It was wonderful meeting you. Vielen Dank für die schnelle Diagnostik. Herzlichen Dank. Sie haben mir sehr weiter geholfen. ganz herzlichen Dank für den ausführlichen Befundbericht und die schnelle Erstellung desselben. Ganz herzlichen Dank auch nochmals für Ihre äußerst nette und freundliche Art und Ihre fachliche Kompetenz. …She’s doing well. A massive improvement – quite a few A&E trips still but not nearly as many as there were – and when she is well she’s actually raring to get going, get things done, see people, get out of the house and more. She even rode a polo pony yesterday for 40 mins. …Thank you so much once again. You are the first person in 6 years who has said they can help, and you have helped. Hugely. We’ll be forever grateful. …..I have improved quite a lot. .. The Nutcracker surgery has helped hugely with my hydration levels. I was constantly dehydrated despite being on an extra litre or 2 of fluids daily. I can now ‘wee’ (pass urine) daily, yet prior to the surgery my bladder retained so much fluid whilst I was only able to manage to use the loo every 3/4 days….I am getting stronger …. Anyway, I would just like to say thank you so much again for helping me, you know how excited we were when you found the compressions. We are passing your name around to medical professionals as much as we can. One of the immunology doctors at the Royal Free Hospital asked for your contact details the other day. He has a patient with similar symptoms…. ganz herzlichen Dank für die exzellente Untersuchung und Beratung sowie die fixe Zuleitung der Unterlagen! vielen Dank für Ihre E-Mail und die Informationen! …Ich danke Ihnen sehr! Wir sind sehr froh, bei Ihnen Patient zu sein. Wir fühlen uns stets bestens betreut und auch … mag Sie sehr. Thank you so much once again Professor, and thank you for such a quick report! Your efforts and skill are greatly appreciated! …I remember during my examination you said you admired my strength. But I believe I would not have the courage to power through without you. You were the very first person to believe in me and truly help find out what was wrong with my body. When a person have confidence in you, one finds the strength one did not even know was there. Your specialisation is rare and I know you yourself, prof Sandmann and all your patients struggle to make the rest truly understand these diagnoses. It is very hard, but at least there is someone. And I will be forever grateful that one of that someone is you. I can not express this enough; Your kindness is beyond anyhting I’ve ever known. And I do not only speak for myself saying this, because I have talked to so many people that struggle with the same as me and we all agree you are a true miracle worker with a true passionate heart. My family also sends their greetings and Thanks again, for helping me…. wir möchten uns nochmal herzlich für die freundliche und umfassende Behandlung unserer Tochter …bedanken. 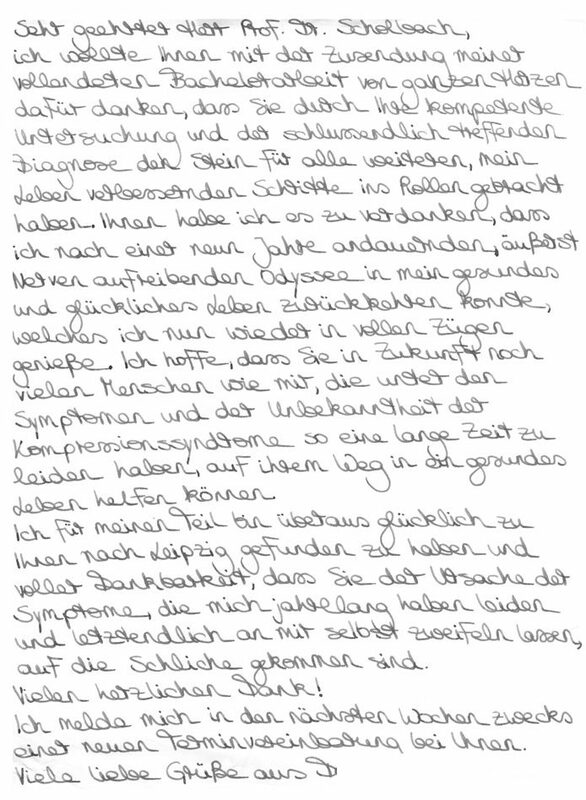 …Wir bedanken uns… und verbleiben mit freundlichen Grüße..
auf diesem Wege möchte ich mich nochmal ganz herzlich für die Diagnosestellung unserer 17-jährigen Tochter im Oktober 2017 bedanken und Ihnen die Info, die ich heute an Prof. Sandmann geschickt habe, zukommen lassen. Ich kann mich den bereits auf Ihrer Internetseite positiven Patientenstimmen nur anschließen und es können – glaube ich – nur betroffene Personen richtig nachempfinden, wie steinig, schwer und schmerzhaft der Weg bis zur Diagnosestellung für die gesamte betroffene Familie sein kann. Ich bin sehr froh, dass ich Sie durch Eigenrecherche im Internet gefunden habe und ….anschließend von Prof. Sandmann operiert wurde! ….geht es wesentlich besser! 🙂 Sie kann leicht verträgliche Kost in mehreren kleinen Portionen relativ beschwerdefrei essen. Ihr Gewicht hat sich mittlerweile bei ca. 61 kg eingependelt (nachdem es vor der Operation bei 56 kg lag – die gesamte Gewichstabnahme hatte bei 17 kg gelegen!- Die junge Frau musste intravenös über einen Port ernährt werden, da sie nicht mehr essen konnte! Schließlich hatte sich der Port infiziert, so dass akut gar keine adäquate Ernährung mehr möglich war – Einfügung durch T. Scholbach). …..Seit der OP am 30.10.2017 friert ..nicht mehr, sie ist wesentlich leistungsfähiger. Sie geht 2 mal in der Woche (min. 1000 m) zum Schwimmen, nimmt wieder am Schulsport teil und fährt regelmäßig Inliner…..
Viele liebe Grüße bitte auch an Herrn Dr. Al-Maqablah, Herrn Dr. Verginis und an Dr. Hofer! Ihnen allen und nicht zu vergessen – Prof. Scholbach – haben wir sehr viel zu verdanken!!! Wenn alle Ärzte so wären wie Sie alle, dann hätten es viele Patienten leichter, den richtigen Weg zu finden !!! Ganz liebe Grüße (natürlich auch von … 🙂 …. Patientin aus Norwegen, die an mehreren Gefäßkompressionssyndromen litt, als Simulantin und vermeintlich psychisch kranke junge Frau vielerorts abgewiesen wurde, bis wir die Diagnosen gestellt haben und die Dank der Operation dieser Gefäßkompressionssyndrome durch Prof. Sandmann nun nicht mehr mit dem Mund schreiben muss, sondern ihre bis dahin völlig gelähmten Hände wieder benutzen kann – ein Trost und Ansporn für alle, die nicht an Ignoranz, Überheblichkeit und ihrem schweren Schicksal verzweifeln sondern deren Hoffnung schließlich belohnt wird. Ich verneige mich vor solchen Menschen ! …. I am so grateful that i managed to meet you, yesterday!!! Thank you for everything you have done to me so far! ….Herzlichen Dank, für Ihre zugleich hochkompetente und wertschätzende, menschliche Betreuung! Vielen Dank für Ihre Lieben Wünsche! Ich war von Anfang an in den besten Händen und habe Dank Ihnen ein neues Leben geschenkt bekommen. Ich freue mich bald wieder Sport zu treiben und in meinen Beruf zurück zu kehren! Ein schönes Osterfest auch für Sie! Ich möchte mich ganz herzlich bei Ihnen und Ihrem Team für die freundliche, fürsorgliche und professionelle Untersuchung, Betreuung und erfolgreiche Operation bedanken! Ihre Diagnose, Herr Prof. Dr. Scholbach, war ausschlaggebend um das beste Chirurgen-Team zu finden, die meine Kompression Syndrome erfolgreich behandelten/operierten. Dafür bin ich Ihnen für immer dankbar! Vielen lieben Dank, Herr Prof. Dr. Sandmann, Herr Dr. Verginis und Herr Dr. Al-Maqablah für Ihre Geduld, Zeit und Expertise um all unsere Fragen zu beantworten und Ihre sicheren und ruhigen Hände, die meine OP so erfolgreich machte! Ich bin bereits auf dem Weg der Besserung, auch wenn Geduld gerade sehr gefragt ist. Für ein gesundes und glückliches Leben lohnt es sich aber, jeden Tag hart zu arbeiten und zu kämpfen. Ich bin Ihnen Allen unendlich dankbar und wünsche mir, dass Sie noch vielen weiteren Leidenden diagnostizieren und helfen können! Gott segne Sie und Ihre Familie! Ich danke Ihnen noch einmal ganz herzlich für die jahrelange wunderbare Betreuung. Ich verdanke Ihnen so viel, mein Leben. Dafür möchte ich mich noch einmal aufrichtig bei Ihnen bedanken. Sie sind ein so wunderbarer Arzt, setzten sich für alles und jeden ein, machen soviel für uns Patienten und nehmen sich wirklich Zeit für uns. Bei Ihnen fühlte ich mich jederzeit verstanden und aufgehoben. Bleiben Sie so wie Sie sind, Sie sind ein wunderbarer Arzt mit Herz. Ich Danke Ihnen für alles…….. I was very delighted to have met you, a very knowledgeable, professional and most of all friendly. I wanted to thank you for the experience that I had and gratfull that I found answers to my pain. I wish if there’s more doctors like you, your expertise has proved that there is hope for these conditions. Sehr geehrter Herr Prof. Scholbach! Sie werden sicher von Herrn Prof. Sandmann wissen, dass es mir bezüglich Essen sehr gut geht (Anmerkung von Prof. Scholbach: vor der Operation war nur noch eine Ernährung über einen venösen Port möglich). Anfang Jänner konnte ich sogar zwei kleinere Berge erklimmen. …..Ich wünsche Ihnen alles Gute und viel Erfolg bei Ihren Arbeit! an dieser Stelle noch einmal mein herzlichstes Dankeschön für Ihre sehr umfangreiche, kompetente und vor allem zeitlich rasche Untersuchung….Besten Dank für Ihre Mühe. Thank you very much for the detailed report! I greatly appreciate your expertise and the trip was well worth it. …. Herzlichen Dank! Our trip back to Amsterdam was very fluent, so we had plenty of time to reflect on your approach which was both warmhearted and very skilful at the same time. It was an impressive consultation. 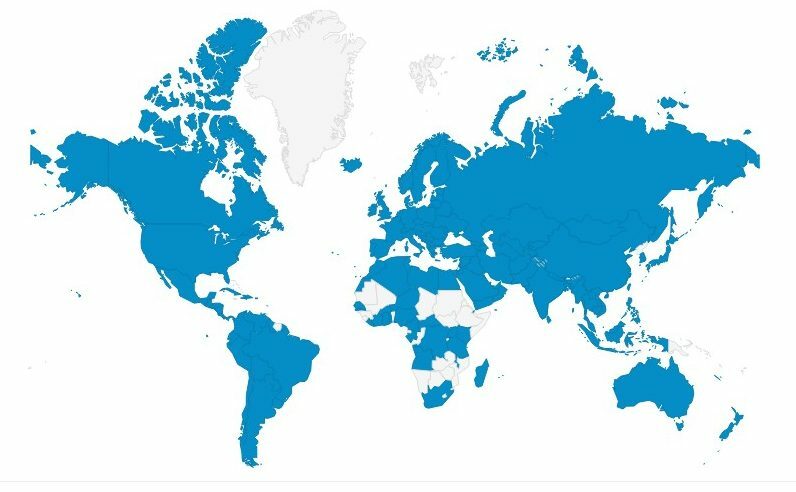 Thank you for the report…..
ich möchte mich noch einmal bei Ihnen für den Termin und das aufklärende Gespräch zu Beginn dieser Woche bedanken! Sie haben mir wirklich sehr weiter geholfen. Ich weiß jetzt endlich, warum es mir nach der Embolisation im Juni 2015 so schlecht ging. für die rasche Antwort, für die Zeit die Sie sich genommen haben und für die ausführliche Diagnose. Wir wünschen Ihnen und Ihrer Familie ein schönes Weihnachtsfest und danken Ihnen auch nochmals von Herzen für die langersehnte Diagnosestellung und auch für die sehr gute Kooperation mit Prof. Sandmann!! Ich war bei Ihnen beiden in sehr guten Händen! Und natürlich auch einen guten & gesunden Start ins neue Jahr. …Ich danke Ihnen für ihre Mühe. Danke Ihnen auch das auch Sie so für die Erkrankten da sind. I just wanted to thank you greatly for your service. This world is lucky to have a man with your kind human nature and intelligence. vielen, vielen herzlichen Dank für den Termin bei Ihnen, Klärung der Beschwerden (doch nicht nur im Kopf und muss ‘nur mehr Sport machen’ als Therapie) und bereits geschickten, sehr ausführlichen Befund! Hervorragende Arbeit! Kann es nicht in Worte fassen! Herzlichsten Dank! ……Many thanks for this and accepting to meet us. We had a fruitful discussion with Prof. Sandmann and agreed to the surgery. I will be back soon. vielen Dank für den Befund und auch dafür, dass Sie sich am Montag so viel Zeit genommen und mir alles erklärt haben. Der Termin bei Ihnen war wirklich total angenehm. Nach der OP ….geht es mir im Bauchraum deutlich besser als zuvor. Insbesondere habe ich wieder eine normale Darmfunktion und das ist bisher so gut geblieben. Meinem Sohn ….geht es nun auch viel besser (nach der Operation – Einfügung T.S.). Er hat wieder Lebensmut und eine gute Motivation, um seine Masterarbeit im Maschinenbau durchzuziehen. erstmal möchte ich mich bei Ihnen für die ausführliche und genaue Untersuchung …bedanken. Wir haben uns bei Ihnen sehr gut aufgehoben gefühlt. Ich habe mit meinem Mann noch lange über die bevorstehende Operation …. gesprochen und wir würden gerne den schnellst möglichen OP Termin annehmen. Ich merke, dass mein Körper mehr und mehr abbaut und ich nichts mehr essen kann. Auch das Trinken fällt mir von mal zu mal schwerer. …Vielen lieben Dank nochmal für alles. Zunächst noch einmal vielen Dank für Ihre schnellen und unkomplizierten Diagnosen ! Dunbar ist inzwischen …. äußerst erfolgreich operiert worden …Keine Schmerzen mehr und das gesamte Verdauungssystem arbeitet wieder einwandfrei! vielen lieben Dank für die tolle Unterstützung. Endlich habe ich einen sehr kompetenten und erfahrenen Arzt kennengelernt, der auch mal über den Tellerrand hinausschaut. Dank Ihnen habe ich nun wieder ein wenig Vertrauen in Ärzte zurückgewonnen. Thank you so much for taking the time to write that up for me. It means so much to me. 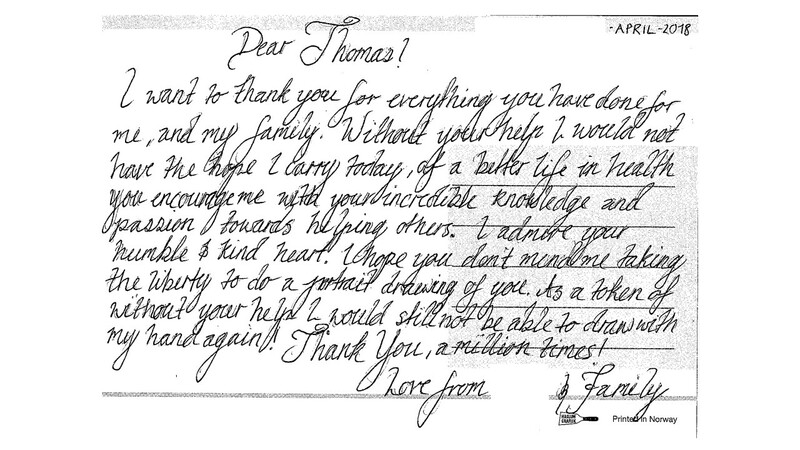 It is very obvious that you care deeply about your patients and I am so grateful to be one of them. Ich danke Ihnen, Herr Professor, für diese “relativ” (für einen Laien) klaren Daten. …Recht vielen Dank für diese Erklärungen. Ein grosses Lob für die ausgezeichnete Übersetzung [der website ins Franzäsische ] ! Ich bin gespannt zu wissen, was mein Nervenarzt Montag darüber sagen wird. Auf jedem Fall werden die kostbaren Websiten sehr nützlich sein. Ich möchte mich nochmal für die ausführliche Untersuchung und Beratung während meines Termins bedanken. Das ist keine Selbstverständlichkeit. Ich habe mir die Optionen mittlerweile durch den Kopf gehen lassen und bin sehr an einer operativen und langfristigen Lösung interessiert….. I can’t thank Prof. Scholbach more highly for diagnosing 5 artery compressions. I was diagnosed with MALS median accurate ligament syndrome, NCS nutcracker syndrome, PCS pelvic congestion syndrome, MTS may thurner syndrome and with a compression under the left femoral vein. All the syndromes and compression went in missed in the UK I’d been poorly for 14 years and each year was getting worse health wise up until the point I could no longer eat or absorb foods was constantly fainting and needed to use a wheel chair. Prof. Scholbach then kindly put me in touch with the best surgeon iv ever met Prof.Sandmann who performed pioneering surgery for my 5 compressions. Without these two professors I don’t think I’d be around for much longer as I was rapidly deteriating toward the end. I know have my life back I can eat drink as much as I like walk! I don’t feel faint and the lists of symptoms fixed goes on and on! Thank you so much. I would not like to give up at this point – we have invested so much time and money already and we truly value your interpretation and input. Your reputation among those suffering from these compression syndromes in the USA is second to none. The patient stories we have read of those who have consulted with you have given us hope that we might finally be given some direction and recommendations on how to move forward. zunächst einmal vielen Dank für die sehr freundliche Betreuung und gewissenhafte Untersuchung meiner Tochter X. Ihre ruhige und verständnisvolle Art gefällt uns wirklich sehr! Das musste mal gesagt werden! die auf Ihre Empfehlung hin durchgeführte OP verlief [unkompliziert]….. Nach der OP hatte ich keine daher rührende Probleme und habe mich deswegen schnell erholt. ….Direkt nach dem Aufwachen aus der Narkose spürte ich bereits Verbesserungen im Magen- und Darmbereich. Der bei mir immer presente Durchfall war direkt weg. Ich denke auch, dass ich besser Luft bekomme. Die Kopfschmerzen sind bisher nicht mehr aufgetreten und der Schwindel ist deutlich weniger geworden. Zudem fühle ich mich nun ingesamt besser und bin motivierter…..Über Alles ist die OP für mich ein Erfolg und ich bedanke mich ausdrücklich bei Ihnen…weil mir Ihre Mühe meine Lebensqualität deutlich erhöht hat. Thank you so very much for reading my letter and for replying so fast. I am happy that it was an interesting one for you to read. Thank you also for your thoughts – obviously I am happy! I am honoured for such a words from such individual as you are. There certainly are not many such doctors as you are…….. I can’t wait and am thrilled to speak to you. Again thank you so very much for all your help and time, there really is no word to describe how grateful I am. With my very best regards! Thanks a million for your super quick reply. Much appreciated! ………. However, after referring to your name they agreed to check Wilkie’s syndrome assumption ………… It appears that your name opens many doors here!……. Thanks again for the advice. Now I know which direction we should move to. In case if the vascular nature of the pain syndrome is confirmed at least indirectly here in Moscow. We will consider going to Germany to continue examination and possibly further treatment in your clinic. C. is improving since her operation on 15th February. She has been able to weight bear on the right just days after the operation. The legs are still weak but this will just need Physio and time to build the muscles. Yesterday she walked very slowly without any aids and without pain about 10 metres, this is the first time since February 2013. It was wonderful to see. Her feet and lower legs were warm straight after surgery and if she stays laying down they are warm if she moves about they become cold until she has laying down again for many hours usually it takes overnight to come back warm. She has a lot of pain but we hope over the next few weeks this will improve. Another symptom she still has is nausea but we hope this will improve as well with time. In the uk I showed our top vascular surgeon your results and he told me that 30% of people have May Thurner syndrome and it does effect their legs. He told C. if you have the operation in Germany I will by you a pint if you walk again that’s how confident I am it won’t work or help her symptoms they are conversion not vascular. Thank you so much for all of your help and advice, we would never of seen this if we hadn’t of found you and your advice to go and see Prof S. who is a very kind, clever gentleman. Between the two of you you’ve given my daughter hope of a life without pain and suffering. I will never be able to thank you both enough. Guten Morgen Herr Prof.Dr.Scholbach ! Vielen Herzlichen Dank für den Link. Die Beschreibungen haben Sie so verständlich dargestellt, daß auch ich es kapiere. Ich bin ganz begeistert von Ihnen. So einem netten, kompetenten Doktor bin ich in meinem 14jährigem Leidensweg noch nie begegnet. …..
Nochmals vielen ,vielen Dank für Alles. On the other hand, the condition described above as Nutcracker syndrome for me was clearly a vascular problem with indisputable pathological clinical symptoms even for somebody not diagnosed with MS: For example, reflux of blood into the gonadal vein and scrotum leads to painful varikozele and can impair fertility. Both of these symptoms had been part of my problems in the recent past without any of the doctors in charge even thinking of Nutcracker. Now, with Dr. Sclafani’s gold-standard diagnosis, I thought that it would be possible to get the Nutcracker stenting done in Germany and take advantage of reimbursement of costs by the medical insurance company and of an unproblematic aftercare close to my home. This was naive and a big mistake, as I had to find out during 2013. For me, getting to know Dr. Scholbach was another stroke of luck. He is a paediatrician and ultrasound specialist. At that time, he was Head of the Clinic for Paediatrics and Adolescent Medicine in a hospital in Chemnitz. I sended him an email describing my case, including the CCSVI background of my treatment in Brooklyn. He immediately answered my mail via telephone and told me that he was very interested in this subject since having read the first Zamboni papers. My bad experiences with doctors in the past concerning CCSVI in mind, I was totally surprised. Dr. Scholbach explained to me that the idea of pathological effects of CCSVI outflow problems is very plausible to him and seems to fit to his own studies and hypothesis connected to the Nutcracker syndrome (NCS), which he had coined “midline congestion syndrome” in 2006, not knowing about Zamboni’ s study yet. Interestingly, his approach to this venous cause of several sometimes misdiagnosed symptoms or diseases mistakenly called “idiopathic” comes from the descriptions of symptoms given by ill children and adolescents in his hospital practice. During his medical examinations of the patients with colour doppler ultrasound in the past, he has found more than 1000 cases of left renal vein compression, which is a remarkable basis for a correlation between symptoms described and outflow disturbances caused by NCS. Before he startet the ultrasound examination of my abdomen and kidney area, he asked me about my symptoms. Besides the other well known typical “MS”- symptoms, I mentioned my long term problems with back pain and this strange and debilitating problem of a balloon-like feeling in my upper abdomen, connected with increasing weakness in my legs when trying to move faster. I was totally flabbergasted when Dr. Scholbach told me that all these clinical symptoms are common in young Nutcracker patients. Sometimes – that’ s my understandind of his explanation – during childhood and adolescence developmental changes of the venous pathways prevent from pathological and debilitating problems otherwise following a Nutcracker phenomenon found in early years. I was a patient of yours a couple of years ago. I was referred ….for surgery and had it in July 2014. I just wanted to update you and let you know that it was a total success! Since then, I have been able to go to school and get my pre-med certificate. I also finished a master’s degree in business and I’m applying to medical schools next summer. Every day since the surgery, I wake up and feel great! The best news of all is, after 5 years of infertility problems, I am currently pregnant. I know the surgery isn’t intended to treat infertility, but I think MALS could have been a big contributor for why we were having so much trouble in the beginning. We chose to wait a year after the surgery to start trying again and it happened after just one year of trying. I had a complete resolution of epigastric pain, acid reflux, extreme fatigue, anxiety, and most of my other symptoms within 6 months of surgery. I am very thankful that …. I am able to live my life better than ever thanks to your diagnosis and treatment. I just wanted to update you after all this time and thank you for all the research you have done on this condition.